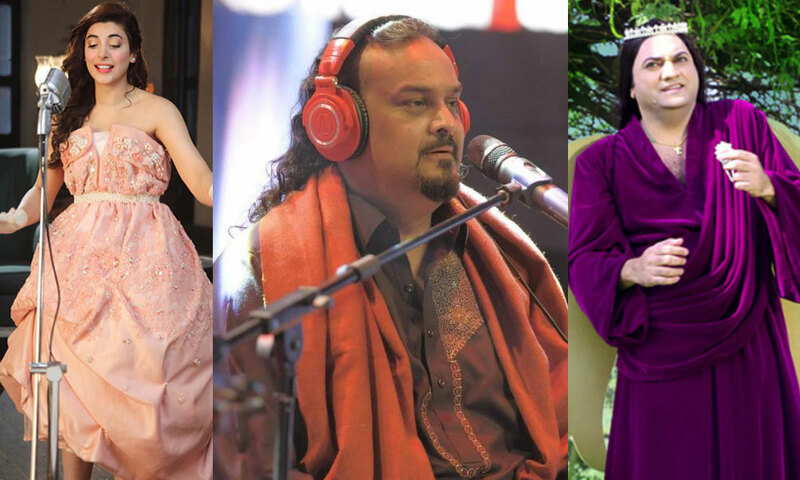 The Pakistani music industry produces a number of hits every year. From soft tones to the fusion of rock and pop, the industry has recorded a lot of songs which have topped the charts, nationally, and earned recognition on the international platform. The year 2016 was no stanger to the greatest hits. Let’s have a musical goodbye of the year by listening the blissful songs of 2016. ‘Chalti rehti hai…rukti nahi…dosti’ is by far the most iconic somg of the country. Nazia Hassan gave a part of her soul to this song. When Ho Mann Jahan introduced their version of the song in the beginning of the year, all music lovers appreciated the song. Zebunnisa Bangash filled in the shoes of Nazia Hassan and it turned out to be perfect. The song had a Coke Studio touch to it making music lovers go gaga over it. Coke Studio released the song, Ae Rah e Haq K Shaheedo, to pay homage to the country’s martyrs. You might be raising your eyebrow over this choice, isn’t it? The song is just a remix. We agree! But, what made this song special was Amjad Sabri’s part. The song was released a couple of months after his tragic death and his magical voice left everyone in his trance. You are missing on a lot if you haven’t listened this masterpiece yet. An English song with the fusion of classical music is at least my dream come true. Suno suno. It’s a good one. Have you ever gone head banging to a Urdu song? Not really, no? Well, this song will actually break all those stereotypes. This song will actually make you to do a little head-bang to the awesome bass of the song. Exceptionally great song! Asrar’s creations can hardly be missed. Shakar Wandan is one of its kind. A song which will make you tap your feet to the tone. In fact, it made a few of our politicians dance on its tone. Definitely one of the best. Zindagi mein zyada mithaas ho, wo bhi hum say bardaasht kahan hoti hai. So after providing a sweet list of the top best songs, we are presenting the worst ones too. You can go all Mein naheen parhoongee, mein naheen parhoongee. But, sweet readers we have special picks for you too. And God knows how much work we have to do for those special picks. Her andheray k baad ujala hai. So read on! After #Chaiwala rose to fame, the media launched on him like an Aunty launches on a Agha Noor kurti. See the madness. -_- In an attempt to revive his music career, one of the directors of the industry asked him to be the face of ‘Chaiwala‘ – applause for novelty – in his song. The song is cancer to ears and should never be played again. Urwa Hocane tried her luck in mucic and recorded a cong called, Ao Lay Kar Chalein. Trapped in a Candy Floss, Urwa terribly failed in making a mark. Aaaand here you smile. I know you have been questioning my sanity for not mentioning the song, but here it is. Momina and Rahat came together and used the magic of their voice on the audience. The song became an instant hit and it is probably one of the most searched songs of the year 2016. Hoping for more of such masterpieces. The Tamaashbeen released the song in Nov 2015, but after it got featured in a short film produced by undergrad students, it became an instant hit. Everybody loved the casual style of singing. A one of a kind song. Sue me, the writer, if you don’t agree, but man I have to include it in. Coke Studio’s tribute to Amjad Sabri has been one of the masterpieces of the music industry. Granted, at the time of recording nobody would have thought that it would become the last memory of the singer. The entire nation held on to the song. One word for the song: Impeccable!